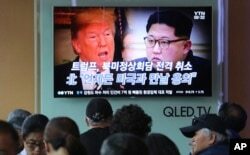 Arms control experts estimate that the dismantlement of North Korea’s nuclear program could take a decade to complete, and cost $20 billion, if a nuclear agreement is reached between U.S. President Donald Trump and North Korean leader Kim Jong Un when they meet in Singapore on June 12. “The hard work has not yet begun, and it is gong to take sustained energy on the part of the United States, South Korea, Japan, China and North Korea. It’s going to be a multiyear long process,” said Daryl Kimball, the executive director of the Arms Control Association in Washington. President Trump has said he expects a "very positive result" from the North Korea nuclear summit, but he also said it will likely be the beginning of a process to resolve differences over the extent of the North’s denuclearization, and the specifics regarding what sanctions relief, economic aid and security guarantees would be offered in return. 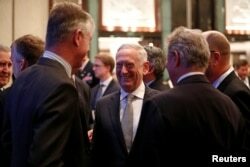 U.S. Defense Secretary Jim Mattis said on Sunday that North Korea would only receive sanctions relief after it takes "verifiable and irreversible steps to denuclearization." U.S. Secretary of Defense Jim Mattis arrives to give an address at the Shangri-la Dialogue in Singapore, June 2, 2018. This position aligns closer to the Kim government’s stance that denuclearization measures and concessions be matched action for action. And it backs away from demands made by some in the president’s national security team that Pyongyang quickly and unilaterally dismantle all its weapons of mass destruction before any concessions would be offered. North Korea is estimated to have 20 to 80 nuclear warheads, both known and covert nuclear research and processing sites, and thousands of ballistic missiles that can be launched from mobile vehicles, and submarine based launchers have been tested in recent years. With such an extensive nuclear arsenal it could cost $20 billion to achieve the U.S. goal of complete, irreversible, and verifiable nuclear dismantlement (CVID), according to a recent study conducted by Kwon Hyuk-chul, a Kookmin University professor of security strategy. Kwon based his assessment in part on past nuclear deals with North Korea and Ukraine’s experience in dismantling its nuclear arsenal after the fall of the Soviet Union in the 1990s. “In the process of the nuclear dismantlement of Ukraine, all of the strategic nuclear warheads that Ukraine possessed were transferred to Russia and were dismantled there. In doing so, the United States provided large-scale containers and technical support to assist with safe dismantling,” said Kwon. The Kookmin University study estimates it would costs $5 billion to dismantle the North’s nuclear arsenal and supporting facilities. Another $5 billion, Kwon said, would be needed to fulfill a U.S. pledge, made as part of a 1994 nuclear agreement with North Korea, to build two light water reactors to generate electrical power. Another $10 billion in economic aid would be needed both as incentives to convince the leadership to give up its nuclear deterrent and to help transition the over 3,000 to 10,000 nuclear workers into peacetime professions. President Trump recently said he does not expect the U.S. to provide any government aid but could offer American private investment if North Korea gives up its nuclear weapons. Instead he said the Kim government should look to South Korea and China for any direct economic assistance. A recent Stanford University report estimates it would take over 10 years to permanently dismantle the North’s nuclear program. Stanford nuclear scientist Siegfried Hecker, who visited North Korea in the past to assess the country’s plutonium program, Robert Carlin, a former CIA Korea analyst, and researcher Elliot Serbin, conducted the detailed study of the North’s nuclear program. The researchers listed specific categories that must be verified by outside inspectors including; nuclear fissile material of plutonium, tritium for fusion Hydrogen bombs, enriched uranium, nuclear reactors, centrifuge facilities, long and medium and short range missiles, test engines, and space launch vehicles. The authors proposed a three-phase denuclearization process that would halt or limit further activity in the first year, roll back or dismantle over five years, and permanently eliminate North Korea’s nuclear capabilities in 10 years.